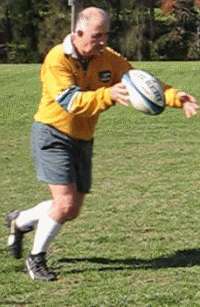 The drop kick is used often in rugby. Ball must bounce before being kicked. It is used for starting and restarting games. You can get points for field goals (drop goals). You can also score points. When you put the ball over the opposition cross-bar with this type of kick during the general course of play you get 3 points for your team. It`s called a "field-goal" or "drop-goal". You are allowed to do it at any time during play and from anywhere on the pitch. Field goals become more difficult as you get further from the posts and / or nearer the touch lines. It's rare to be successful from beyond the half-way line. 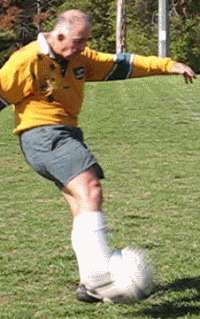 An attempt at goal tends to be regarded as an admission that the opposition defence is too good for you to score tries. You may also use this kick to convert tries instead of using a place kick. This done rarely, when saving time is important. Players hold the ball in a number of ways. This is what I prefer. Hold the ball about waist height either vertical or pointing down and away from you as you prefer. One hand is high and behind, steadying the ball. Your other hand is below, balancing the ball on your fingertips. Swing it gently upwards and slightly outwards to about chest height then remove your lower hand from the ball. Now you have the ball at bent arms length perfectly positioned for the kick. At the same time take a step forward with your non-kicking leg and raise your kicking leg behind you. You guide the ball downwards as you swing your kicking leg forward. WHACK! Your foot strikes the ball. You can hit the ball straight on, with the boney top of your foot or use the inside of your foot. You may want to kick the ball higher to allow chasers time to get under the landing area of the ball. In this case, relax. Allow the ball to bounce higher before your foot strikes the ball. You will kick higher because your foot will be further under the ball, driving it vertically. For distance, hit the ball harder and on a lower trajectory. Always follow through. Whichever action you use, kick through the ball rather thean at it. You will be more accurate and kick further. It looks as though they should have sent it out to the backs when they had the defence outnumbered but it`s always hard when you`re in the thick of things! Practice your drop kick with two balls. Kick one away the required distance as a target then do the kick you are practicing, trying to land the ball on the target ball. Seeing where your kick goes in relation to the ball you are aiming at tells you how well you are kicking. If you are practicing field goals but don`t have rugby posts to aim at, aim to kick the ball high over and directly in line with the target ball. This is just one of the kicks used in rugby. Load up your kicking toolbox, make sure you have the right kick for the job in front of you. Just follow the link for full details of the other kicks.